Movie Review: Brooklyn-born Darren Aronofsky became one of the most respected filmmakers due to remarkable cinematic pieces such as “Pi”, “Requiem for a Dream”, “The Wrestler”, and “Black Swan”. However, his latest feature, “Noah”, probably his weakest achievement so far, brings us a monotonous entertainment exercise that mixes fantasy, romance, ferocious battles, family drama, and miracles, all in the same Biblical epic story. Noah (Russell Crowe) was chosen by the Creator to accomplish the difficult task of saving the innocent animal species from a flood that will destroy the world. For that, he’ll have to build a gigantic wooden ark and get rid of the diabolic forces of Tubal-Cain (Ray Winstone), at the same time that his faith is put to test, leaving him with the cruel choice between the love of his own wife and children, and obedience to God. The Watchers, who were nothing more than fallen angels living inside a massive rocky body, add a fantastic side to a plot that never held my breath for more than a couple of times along its 138 minutes. The performances were not to remember, while the visual effects and characterization - curious how everyone got old in the course of time with exception of Noah’s wife (Jennifer Connely) and grandfather (Anthony Hopkins) – never had the desired impact. 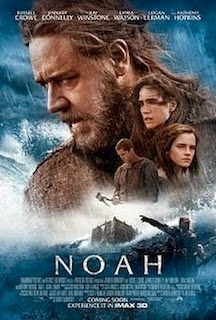 In the end, I realized how I miss Aronofsky’s narrative complexity and visionary bold plots from other times, since overall “Noah” is an absurd and speculative tale, which lacks the faith it wants to transmit, becoming quite unstimulating in its constrained family crisis.